Shannon Patrizio grew up in Washington State, and as a young woman felt compelled to move to Colorado. It is a decision she has never regretted. 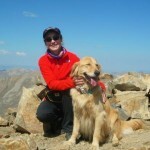 Once settled and working, she began a lifelong activity of running, then added hiking and climbing to her portfolio. In time, she decided to become trained in therapeutic massage, and has been able to help many people from stressed out office workers to young mothers to marathon runners. She was co-owner and manager of a massage therapy practice in the Springs for years, and later decided to open her own business, Rocky Mountain Massage Therapeutics, LLC. Shannon Patrizio is certified with the National Certification Board for Therapeutic Massage & Bodywork (NCBTMB), has a strong code of ethics, and regularly takes part in continuing education.